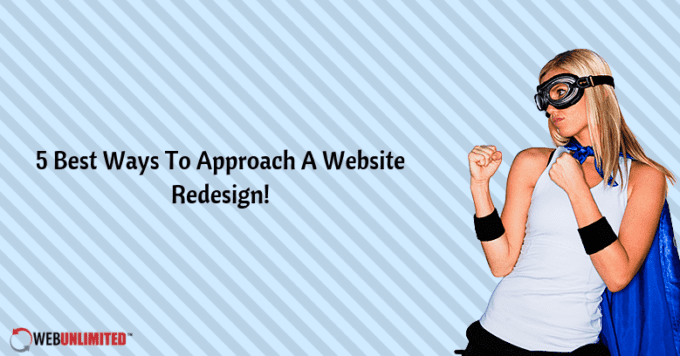 5 Best Ways To Approach A Website Redesign! Over time, it becomes necessary for businesses to consider the age and look of their websites and whether it might be time for a website redesign. Since the goal of a web redesign is to improve site performance and increase whatever conversions there may be, it’s essential that you approach a site redesign from the best angle. Gain positive results with your website update by working with website redesign services that can help you plan an effective redesign from the ground up! As trends continue to change over time, audiences grow and change as well. Marketing trends change as well; the audience you were marketing to before may not be your ideal audience today. Based on all this change, it’s essential to redefine your target audience as the first step in your website redesign plan. An effective website is designed for best use by the target audience, which means your web redesign must accommodate these changes and refocus on your current audience. In terms of the design itself, it’s vital to work with a website designer who can build an effective and responsive website design for you if you don’t already have one. Responsive design is essential today, both for its user-friendliness and its mobile-friendliness. Mobile-ready responsive design is also going to gain better pagerank and traffic. Simplicity in web design is more effective now than complexity. It’s important that your website redesign consider what functions are essential and what users must do on your site, then find the easiest way for them to do it. Get rid of unnecessary pages and links and instead provide users with the easiest way to use your new site and accomplish what they came to do. Another key to an effective web redesign that will improve its effectiveness is finding new and unique ways to present your content to users. Provide content that offers users something new that they can’t find anywhere else, then post it in various interesting formats. Use videos, podcasts, infographics, white papers, and more to attract and hold your user’s attention longer than the few seconds that most people spend glancing over things before they leave a site. Look deeper into determining what focused topic your audience actually wants and give it to them from a unique voice or point of view. The more unique and different your content, the more attention it will get for your new updated website. While doing all of the above in preparation for revamping a website needing an update may seem simple, it’s actually fairly involved. A successfully redesigned website that is based on thorough audience research plus incorporates current technology and elements requires working with a design service that has experience in doing successful redesigns. From this experience, you can work together to determine the changes that must be made and how to effectively make them so your site performs well from the moment of its relaunch. Keeping a website current in its looks and function is essential to keep it relevant, user-friendly, and effective. Every so often, businesses need to partner with a design service and invest in a website redesign to do exactly that. Then you’ll be able to better focus on your changing audience and stay competitive with a fresh look, easy functions, and everything else a modern website needs! Want a Website Redesign In College Station Texas? Discuss Web Redesign With The Pros At Web Unlimited!